Generous breakfasts served in the room! Brunch on Sunday with a booking of 4 nights. 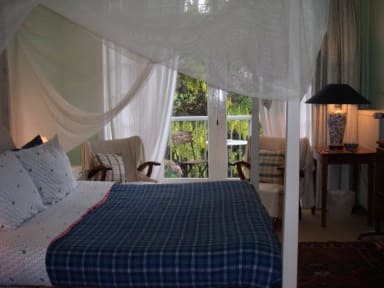 Garden View is a Private Residence Bed and Breakfast in the British tradition. 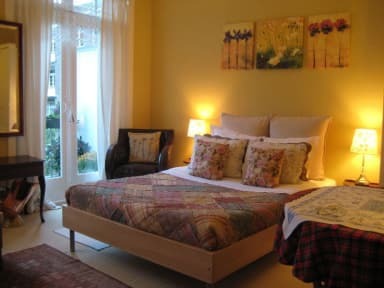 Comfortable, clean and quiet, with two rooms, each with balcony overlooking a lush green garden. A 10-minute walk from nearest train station. NOTE: Not suitable for babies, toddlers or young children! They will be turned away!!! Minimum age required is 25 years, unless accompanied by a parent. Breakfast is served in the room = you can stay in bed till breakfast is served! For a 4 night booking, we offer a complementary demi boutielle wine or brunch on Sunday. We offer cash back when you purchase a museum pass (Museum Jaar Kaart) valid for over 400 museums throughout the Netherlands. Turn in valid cash receipt for €10 cash back. We are a 10-minute walk from the nearest train/metro station, Amsterdam Zuid. Our location is a 7-minute 1-stop train ride from Amsterdam Schiphol airport. We are within walking distance of the Van Gogh Museum, the Rijksmuseum, the Stedelijk Museum and the Concertgebouw. We are also nearby the RAI Exhibition and Congress Center, World Trade Center, the Olympic Stadium, Vrij (Free) University, Vondel Park, and the Judicial Courts. Museum pass: We pay cash back when you buy museum passes (which provide free entrance to over 400 museums throughout the country). Transportation: Conveniently located to points of interest and all public transportation (tram, bus, metro and train). SLIPPERS: Free slippers (to take) = No shoes are worn in house. PARKING: Paid parking is available on the street in our neighborhood (Sundays free parking). There is also secure parking nearby for 8.00 euros for the first 24 hours; 1.00 euro for every 24 hours thereafter. INTERNET: Internet connection is available through our wireless, broadband connection. BATHROOM AMENITIES: The bathroom is stocked with shower gel, shampoo, hair conditioner, body lotion, hand cream and more. ROOMS: Are furnished with flat-screen TV with built in DVD player. We also have a selection of DVDs, books and magazines. SMOKING: NO Smoking allowed and NO Drugs! PAYMENT: The balance due to be paid in CASH upon arrival, including 6% tourist tax. CANCELLATION POLICY: Please note we have a 4-day cancellation policy! Staying at this facility was really nice. The hospitality of our host Nessy was at the highest level. + not mentioned in the description: you'll have a variety of about 100 DVDs to choose from to see on your TV equipped with a DVD-player, you can expess your personal wishes for the breakfast and your breakfast will be according to them! YOU can have coffee or tea any time. The location is OK- railway starion is at 15 min. walk, tram station is at 10 min. walk, food stores are also near. Апартаменты находятся в жилом квартале зюд, в трёх минутах от автобусной и пяти минутах станции метро и поезда. Хозяйка приятная женщина, Несси, расскажет и покажет где и чем лучше заняться, приготовит отличный завтрак. Наш балкончик выходил во двор, и у нас было не шумно.